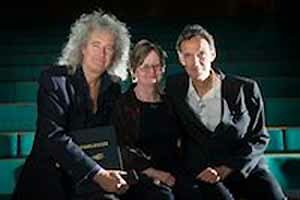 Legendary Queen guitarist Brian May visited De Montfort University (DMU) last night to launch a new book which uncovers the hidden history of stereoscopic photography. Dr May wrote ‘Diableries: Stereoscopic Adventures in Hell’ jointly with DMU PhD student Denis Pellerin, of the university’s internationally-acclaimed Photographic History Research Centre and Paula Fleming, former archivist at the Smithsonian in the USA. It details the stories and images of Diableries, tiny tableaus of costumed devils. The scenes made satirical and salacious comments on politics, society and life in 19th century France. These scenes were printed onto cards which appeared in 3D when seen through a stereo viewer. More than 240 people packed into the Hugh Aston building last night to hear the authors deliver a fascinating lecture on their book and the years of research behind it. Amazingly, the book is the first time anyone has ever written about these cards. They could only find one reference to these cards before, in a Victorian photographic journal. The audience were asked to wear 3D glasses so they could see the special effects as each of the stereo cards were shown. He also praised DMU Emeritus Professor Roger Taylor who is a close friend and with whom he has collaborated on his photographic research. The event was a showcase for the work of the academics in the highly-regarded PHRC. Launched two years ago, it is a centre for international scholarship and world-renowned research and writing. It has a thriving hub of MA students and a community of PhD scholars. The PHRC has a growing number of strategic alliances and its current partners include the British Library; Metropolitan Museum of Art; National Gallery of Art, Washington; National Media Museum, Bradford; The Pitt Rivers Museum, Oxford and the Societie Francaise de Photographie, Paris.